There is a unique situation for Indian fighting skills study, which seems to be impossible regarding to the majority of the other fighting skills. The first reason is a folk instead of aristocratic or family character of fighting practices, which contributed not only to the spreading but also to the preservation of these traditions during peacetime, even if it contains profanity elements and rejection of real weapon techniques demonstration for objective reasons. 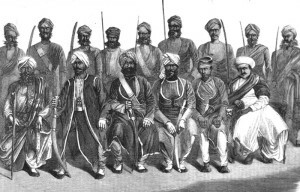 One of the latest wars with large-scale use of cold weapon – is the Sepoy Rebellion, occurred on the territory of North and Central India in 1857-1859 with involvement of large amounts masses, possessing traditional fighting techniques. In British journalism and numerous memoirs of British military there is a considerable coverage and description of the events of this conflict, including fights and duels, weapon and methods of its application, which is an absolutely unique phenomenon for the martial arts world. In total these factors allow to study bookish fighting practices, as well as to form clear idea about the methods and techniques of that how you can apply them in real terms of mass armed conflicts, which minimizes any possible speculations regarding to the purposes of the techniques, their efficiency or any other secrecy and mystery. First you should abandon «white man’s burden» of XIX-th century and perception of the Indians as uncivilized people to learn and understand the content of Indian fencing. 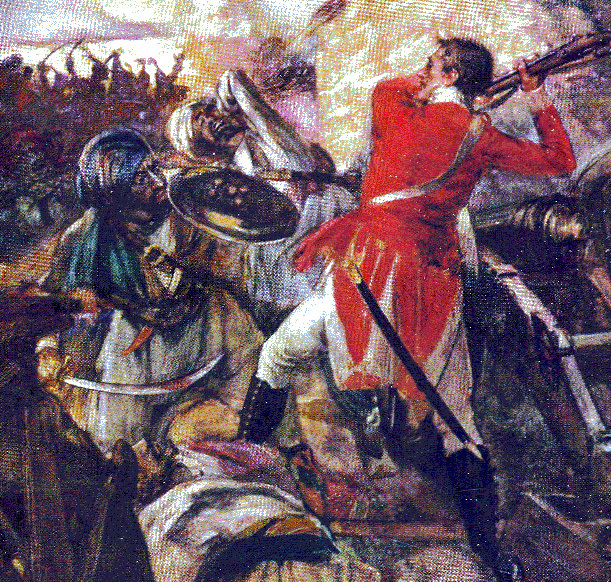 While British fencing theorists described Indian swordsmen as «jumping and aping baboons» without any idea of thrusting strikes, parry or easily parried lunges, the British suffered losses from cold weapon in India, as in none other previous conflict. When thrusting strikes were proved in regular essays to be the top of every advanced fencing system, the British military in India switched hastily to the usage of cutting strikes. Indian armor allowed them to afford easily the strikes of the Europeans, which in the majority of the described cases were not strong enough to cut the turban, protecting Indian warriors’ head, and the armament level of Sikhs hit the imagination of the British. 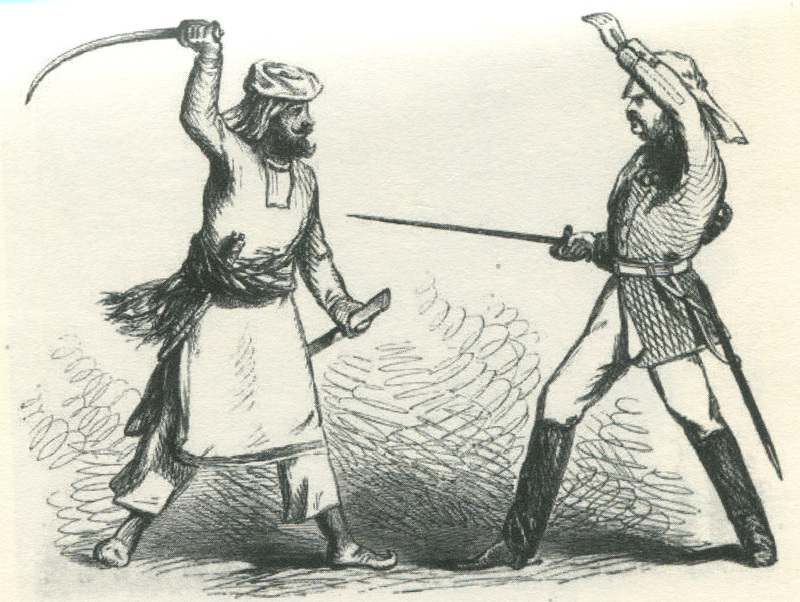 The description of the duels, where the Indians use parry technique or apply thrusting strikes, as well as the description of Indian fencing schools, should change bias towards Indian fencing. For example, in Meerut, in the city of the Sepoy Rebellion origin, there were three fencing schools, where the Europeans had opportunity to watch the diversity of the feints, strikes and other fencing actions. The skill of stick wielding applied to the specific technique of movements is in the base of all Indian techniques. As a result this technique forms skills of controlling the hand by means of twisting of the thigh, muscles of the back and of the shoulder – that is described by the British as «the Indians strike a blow with the whole body». Besides they do it with the constantly bent in elbow arm, which never straightened fully, and with the hand, which is able to hold the stick or the saber handle grasping it totally and moving easily while transmitting the effort towards the held weapon at the same time. This skill projected to the saber allows to make a special kind of strike, which is described by the British as «drawing cut» or «slicing cut». For better understanding of the described process it would be useful to study an example of the use of weapon with a diametrical mounted handle, which was so typical for this region. The mechanics of the strike with this weapon reminds a punch on the table, made by the «master of the house», which is complemented by the reverse pulling movement in case if there is no table. You can act with a simple saber similarly in case of properly trained hand. While using the diametrical mounted handle the tightness of the holding depends on natural position of the habitually clenched and collected fist, as well as on its limitation by structural features of the weapon. But unlike the diametrical mounted handle the handle of the saber requires additional reminding and reflex for tight holding. This could be achieved by a special construction of the talwar handle which requires a necessary hardness of the holding. Here we should dispel another myth about small size hands of small size Indians. The North-West and Central India habitants are slightly different in their size from the Europeans. 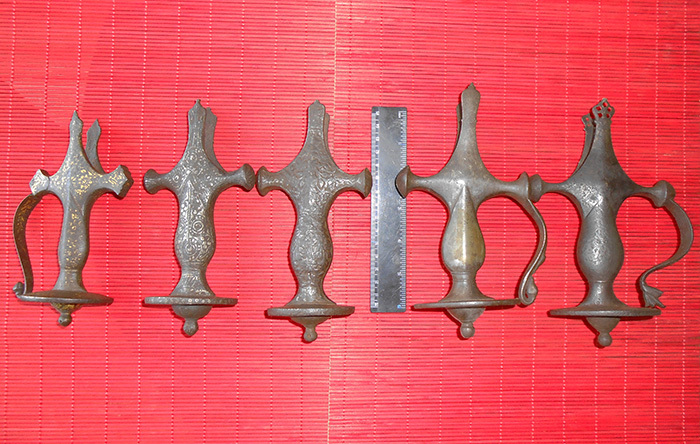 There are talwars with quite big and adequate handles in Rajasthan museums with collections which came from palace arsenals. We should take into consideration the militarization degree of the inhabitants from these regions of India, as well as the degree of women’ and children’ involvement in military training concerning the existence of really small size sabers and their handles. There will be some discomfort feeling for the untrained hand during the exercises with talwar, including the hand skin worn-off in the places of contact with crossing or handle disk. All inconveniences disappear after a correct holding modeling. Besides the main limiting function, also the presence of the disk-like pommel gives extra support for the fist base to make reverse pulling movement. Regarding to the talwar using technique and produced by means of it special strikes, it would be interesting to know direct opinion and impression of the injured people. Since it is possible to strike heavily even with a stick, we will leave aside numerous descriptions of the Indian strikes’ power and will give descriptions of the damages after cutting strikes. Firstly, the British surgeons emphasized the lack of any compression signs. The cut was always clean, thin and without extra noticeable damages, while the wounds after the Europeans customary strikes contained compression signs, breaks and other injury always. The talwar strike cut off the limb completely, or cut to the bone at least. It happened often that the injured man even didn’t feel the pain caused by the damage immediately. One strike could cut off the head, both hands, the hand and the shoulder with a body part, both legs. Wherein this strike was made neither with a running, nor with an amplitude from side to side, but with a compact and collected action with a frequently described and unusual for the author movement of the wrist: «the Europeans could split the enemy’s skull in half with a powerful direct downing strike. The Indians, as a rule, achieve the same result by means of delicate cutting strike of the wrist with the use of ingenuity and mastership instead of brutal force». The Indians managed their talwars so easily, that the British compared this process with the use of a whip or a walking stick. In general the Indian’s confidence in their weapon and ability to manage it was unlimited. While performing military service in the British army and being armed with the musket with bayonet, they didn’t use the bayonet during the infighting, but instead they snapped the musket up by the left hand (or threw it as a spear at the enemy) and started to use their sabers. The strikes’ performance technique and its result affected the tactics of its application. Cutting-off the limbs was the main method. As for foot warriors – their hand with the weapon and standing forward leg were attacked firstly. The last mentioned method was in so great favor that the advanced British put their legs forward intentionally provoking the attack of the Indians. Up to now the Indians are taught to attack the standing forward leg always. As for the hostile hobblers – the Indians attacked not only the their hand with the saber, but also the hand holding the reins or the reins themselves. The lack of obvious swings in the strikes’ performance technique caused the increase of passive protection degree as an extra effect, as the Indian warrior was almost always in the closed pose during the striking. Existence of the reverse cutting phase of the movement in the strike’s trajectory returned the saber in the standby position for active defense and next strike. Cutting striking technique wasn’t a secret for the British. 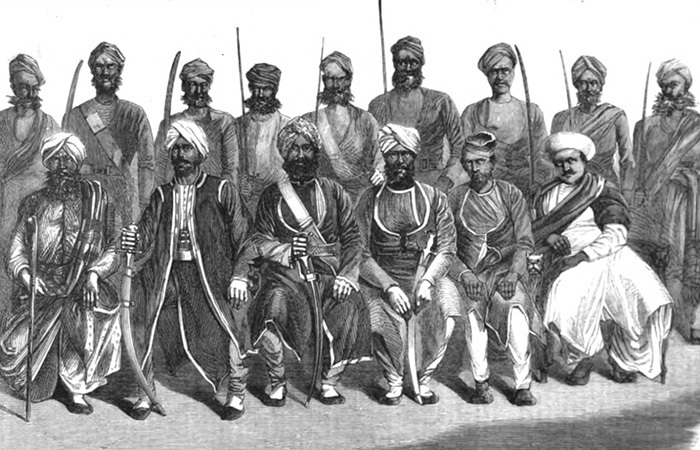 Included into the British army irregular cavalry, the main impact strength of the British in the last Anglo-Indian War, which assumed the majority of the battles, consisted of the representatives of the North-West India population, which were armed with the talwars and used relevant technique. 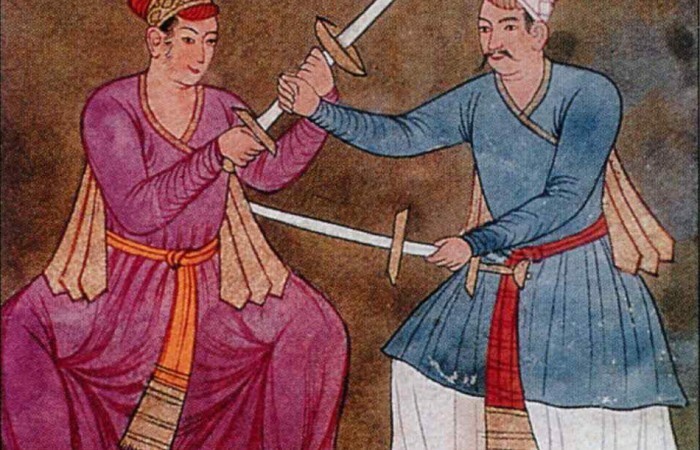 Different methods and skills of tradition weapon proficiency were demonstrated in Indian fencing schools, which were more spread in the second half of XIX-th century than later. Some British warriors, who didn’t suppose the thrusting strike to be the top of fencing art and who didn’t disdain to learn from the aborigines, became skilled in this technique. It is natural, that this cutting technique is impossible without sufficient sharpness of the saber blade. The British mention about the outstanding sharpness of the talwar blades constantly. Besides the joke that «the sabers were so sharp, that the flies were afraid to sit on it», there is a documented fact of cutting a silk scarf after it was put on the blade and shaken slightly. Unfortunately the description of the teaching methods were given only at the end of the XIX-th century, when traditional training was totally displaced by the statutory, and the practical advices for «the strikes, taught in the Indian army now, are hardly different from the advices for the strikes with the ax» and look like following: «it is necessary to teach cutting on the feet, towards the definite objects»; «before there were a plenty of other things, used in practice, but the fencer was never allowed to cut in the air». When could this technique appear, and how traditional is it for this region? At the end of the XVI-th century Persian historian Muhammad Kasim mentioned about the art, which is designed according to the same scheme of exercises as in the present times: the stick, the sword, the sword and the shield, two swords. Burhan Nizam Shah (1510-1553), the prince of Ahmednagar (the Central India), who was a big fan of fencing, the master of sword, and who devoted much time to these exercises, introduced the fashion for this art, so that there were many fencing and fighting schools on the whole territory of Ahmednagar and they were even more popular than madrasah. The best fighters were competing in the fights in front of the sultan almost every day, and those who was the first to inflict the injury was supposed to be the winner. The competitions were prohibited when one or two fighters were started to be killed almost every day, but the practice of private duels appeared. There were no claims to the winner in case of private duels if one of the participants was killed. This practice spread beyond the borders of the Ahmednagar sultanate gradually. Regarding to the construction of the weapon, and more precisely – to the handle of Indo-Muslim type (classic talwar), these handles were already noticed to be used by Moguls during their invasion of India. 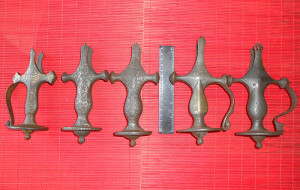 A Persian handle is supposed to acquire the disk-like pommel under the Indian influence, which also follows from its name. This construction, which is limiting the hand, allows to make effective cutting strikes. We could also refer the time of emergence and spread of such form handles to the middle of the XVI-th century. Besides that the fencing and the wrestling go hand in hand in India, and that the majority of facts suit the Iranian version of these North Indian practices origin, which also corresponds to the Muslim period, further period of Mogul invasion and next period of fashion for Persian, there is the one nuance still. Starting from the IV-V-th centuries a classic Indian sword Khanda, which was used in India since an ancient times and up to the end of the XVIII-th century, already had the handle with the disk-like pommel. To the XVI-th century this construction was completed by the developed hilt, which was named «an Indian basket», and the talwar handles were started to be mounted into the Khanda blade gradually. Also the construction of the Khand blade, which is widening to the tip, gives an opportunity to make drawing strikes.